Seemingly small acts can make a massive difference. One example of this is Francesco Tuccio, a carpenter from the small Italian island of Lampedusa. When hundreds of refugees who were fleeing Eritrea and Somalia drowned off the coast of Lampedusa, he was moved to gather the driftwood from the wrecked boats and turn them into crosses, which he offered to survivors as a small but powerful symbol of hope. Pope Francis carried one of the Lampedusa crosses at a memorial Mass to commemorate people who have died, and the British Museum is now displaying a Lampedusa cross as a reminder to people of the refugee crisis the world is facing. One such cross is visiting our parish in September and will serve as a focus of prayer as we conclude the Extrodinary Jubilee Year of Mercy. We will hear a talk from CAFOD on the year of Mercy as the cross arrives to Haverfordwest. There will be a Holy Hour with Benediction and the oportunity to make a our personal messages known to the mingrant population on prayer cards. A evening votive Mass will conclude our week of prayer. Week of Prayer from Thursday 22nd September to Wednesday 28th September. This entry was posted in Uncategorized and tagged Liturgy, News, Pope Francis, Prayer, Year of Mercy on August 13, 2016 by stdavidandstpatrick. This entry was posted in Uncategorized and tagged Fr Liam, News on February 16, 2015 by stdavidandstpatrick. 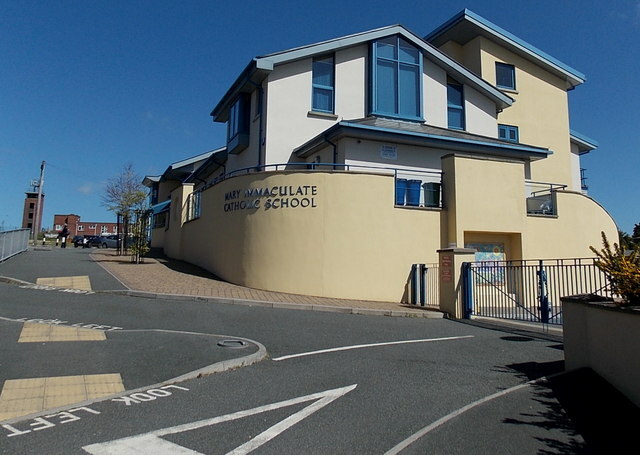 The report of our recent school inspection shows that Mary Immaculate is a “good school.” This means that the school has: “many strengths and no important areas requiring significant improvement”. The school’s current performance is good because most pupils make good progress during their time at the school and achieve good standards in learning and wellbeing and most pupils develop effective speaking and listening skills during their time at the school. For those pupils who need extra support, and those who are learning English as an additional language, they too make very good progress. Nearly all pupils get on well together and standards of behaviour are high with rates of attendance which are good. The school has effective arrangements to monitor pupils’ progress and the school promotes healthy living well through the curriculum and extra-curricular activities. In addition, the school’s prospects for improvement are good as well because the headteacher provides the school with a clear sense of direction and the school has established robust monitoring systems that identify areas for improvement effectively. All members of staff know the school’s strengths and the areas for improvement, and the outcomes from the self-evaluation report inform the school improvement plan successfully. There is a strong team ethos in the school, staff members at all levels are clear about their roles and responsibilities and there are a good range of partnerships that have a positive effect on pupils’ learning and wellbeing. This entry was posted in Uncategorized and tagged Estyn, Mary Immaculate, News on December 9, 2014 by stdavidandstpatrick. Our parish website is becoming more popular! 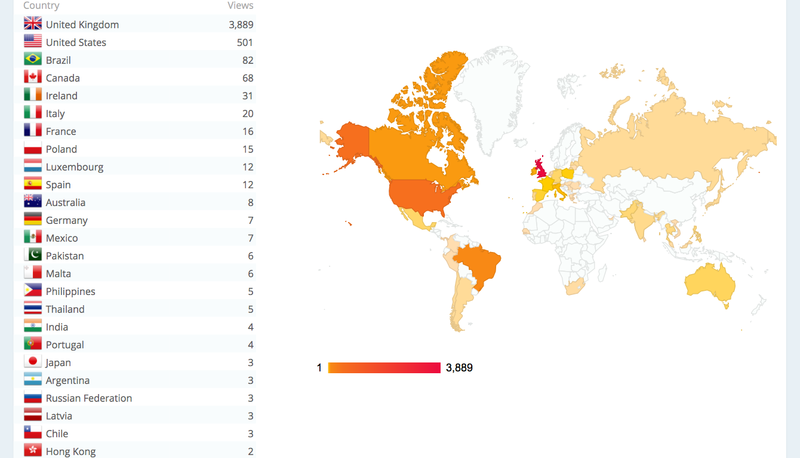 Here’s a map and list of the top places where we’ve been viewed! (Click Image to increase the size – list not exhaustive). This website has been viewed 4736 times with the best ever day being 250 views on 10th August 2014. The Most popular pages are the home page (1473 hits), Newsletters page (351 hits), Contacts page (244 hits) and the Mass Times page (162 hits). 112 people have used the parish website to link through to Mary Immaculate school. The two most popular images are of Fr Liam falling from an aeroplane and the wooden crucifix at the Calvary on Caldey Island. This entry was posted in Uncategorized and tagged Map, News, Website on November 22, 2014 by stdavidandstpatrick.